Virtual reality has beginnings that preceded the time that the concept was coined and formalised. In this detailed history of virtual reality we look at how technology has evolved and how key pioneers have paved the path for virtual reality as we know it today. If we focus more strictly on the scope of virtual reality as a means of creating the illusion that we are present somewhere we are not, then the earliest attempt at virtual reality is surely the 360-degree murals (or panoramic paintings) from the nineteenth century. These paintings were intended to fill the viewer’s entire field of vision, making them feel present at some historical event or scene. In 1838 Charles Wheatstone’s research demonstrated that the brain processes the different two-dimensional images from each eye into a single object of three dimensions. 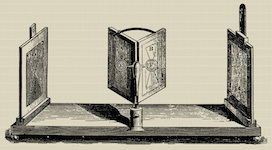 Viewing two side by side stereoscopic images or photos through a stereoscope gave the user a sense of depth and immersion. The later development of the popular View-Master stereoscope (patented 1939), was used for “virtual tourism”. The design principles of the Stereoscope is used today for the popular Google Cardboard and low budget VR head mounted displays for mobile phones. Over time mankind has been slowly but surely creating ever richer ways to stimulate our senses. Things really began to take off in the 20th century, with advent of electronics and computer technology. In 1929 Edward Link created the “Link trainer” (patented 1931) probably the first example of a commercial flight simulator, which was entirely electromechanical. It was controlled by motors that linked to the rudder and steering column to modify the pitch and roll. A small motor-driven device mimicked turbulence and disturbances. Such was the need for safer ways to train pilots that the US military bought six of these devices for $3500. In 2015 money this was just shy of $50 000. 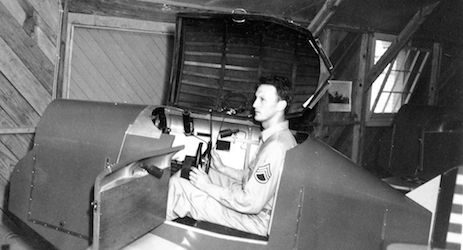 During World War II over 10,000 “blue box” Link Trainers were used by over 500,000 pilots for initial training and improving their skills. 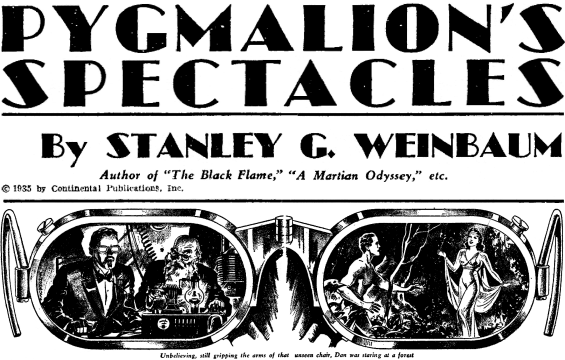 In the 1930s a story by science fiction writer Stanley G. Weinbaum (Pygmalion’s Spectacles) contains the idea of a pair of goggles that let the wearer experience a fictional world through holographics, smell, taste and touch. In hindsight the experience Weinbaum describes for those wearing the goggles are uncannily like the modern and emerging experience of virtual reality, making him a true visionary of the field. 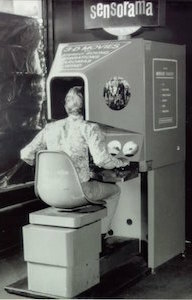 In the mid 1950s cinematographer Morton Heilig developed the Sensorama (patented 1962) which was an arcade-style theatre cabinet that would stimulate all the senses, not just sight and sound. It featured stereo speakers, a stereoscopic 3D display, fans, smell generators and a vibrating chair. The Sensorama was intended to fully immerse the individual in the film. 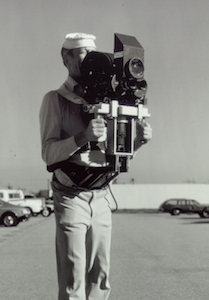 He also created six short films for his invention all of which he shot, produced and edited himself. The Sensorama films were titled, Motorcycle, Belly Dancer, Dune Buggy, helicopter, A date with Sabina and I’m a coca cola bottle! The video below is an interview with Morton about the Sensorama. 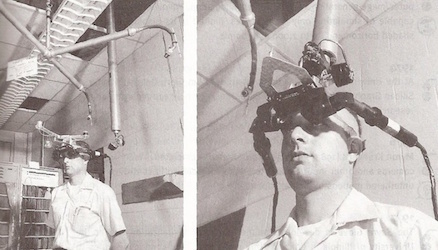 Morton Heilig’s next invention was the Telesphere Mask (patented 1960) and was the first example of a head-mounted display (HMD), albeit for the non-interactive film medium without any motion tracking. The headset provided stereoscopic 3D and wide vision with stereo sound. 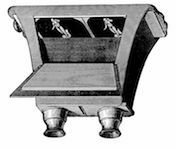 In 1961, two Philco Corporation engineers (Comeau & Bryan) developed the first precursor to the HMD as we know it today – the Headsight. It incorporated a video screen for each eye and a magnetic motion tracking system, which was linked to a closed circuit camera. The Headsight was not actually developed for virtual reality applications (the term didn’t exist then), but to allow for immersive remote viewing of dangerous situations by the military. Head movements would move a remote camera, allowing the user to naturally look around the environment. 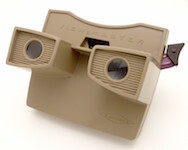 Headsight was the first step in the evolution of the VR head mounted display but it lacked the integration of computer and image generation. A virtual world viewed through a HMD and appeared realistic through augmented 3D sound and tactile feedback. Computer hardware to create the virtual word and maintain it in real time. This paper would become a core blueprint for the concepts that encompass virtual reality today. 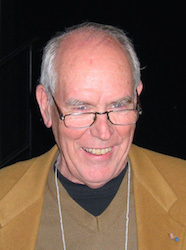 In 1968 Ivan Sutherland and his student Bob Sproull created the first VR / AR head mounted display (Sword of Damocles) that was connected to a computer and not a camera. It was a large and scary looking contraption that was too heavy for any user to comfortably wear and was suspended from the ceiling (hence its name). 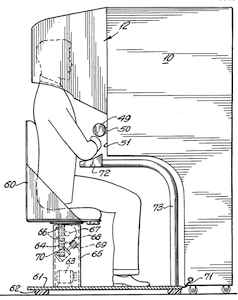 The user would also need to be strapped into the device. The computer generated graphics were very primitive wireframe rooms and objects. In 1969 Myron Kruegere a virtual reality computer artist developed a series of experiences which he termed “artificial reality” in which he developed computer-generated environments that responded to the people in it. 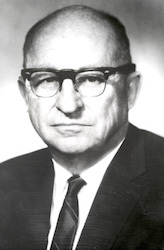 The projects named GLOWFLOW, METAPLAY, and PSYCHIC SPACE were progressions in his research which ultimately let to the development of VIDEOPLACE technology. This technology enabled people to communicate with each other in a responsive computer generated environment despite being miles apart. Even after all of this development in virtual reality, there still wasn’t an all-encompassing term to describe the field. This all changed in 1987 when Jaron Lanier, founder of the visual programming lab (VPL), coined (or according to some popularised) the term “virtual reality”. The research area now had a name. Through his company VPL research Jaron developed a range of virtual reality gear including the Dataglove (along with Tom Zimmerman) and the EyePhone head mounted display. They were the first company to sell Virtual Reality goggles (EyePhone 1 $9400; EyePhone HRX $49,000) and gloves ($9000). A major development in the area of virtual reality haptics. We began to see virtual reality devices to which the public had access, although household ownership of cutting edge virtual reality was still far out of reach. 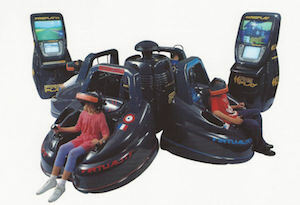 The Virtuality Group launched a range of arcade games and machines. Players would wear a set of VR goggles and play on gaming machines with realtime (less than 50ms latency) immersive stereoscopic 3D visuals. Some units were also networked together for a multi-player gaming experience. The Lawnmower Man movie introduced the concept of virtual reality to a wider audience. 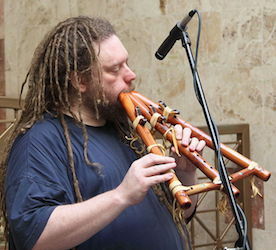 It was in part based on the founder of Virtual Reality Jaron Lanier and his early laboratory days. Jaron was played by Pierce Brosnan, a scientist who used virtual reality therapy on a mentally disabled patient. 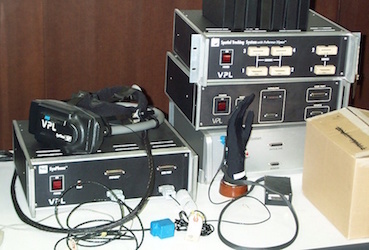 Real virtual reality equipment from VPL research labs was used in the film and the director Brett Leonard, admited to drawing inspiration from companies like VPL. Sega announced the Sega VR headset for the Sega Genesis console in 1993 at the Consumer Electronics Show in 1993. 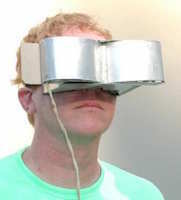 The wrap-around protoype glasses had head tracking, stereo sound and LCD screens in the visor. Sega fully intended to release the product at a price point of about $200 at the time, or about $322 in 2015 money. 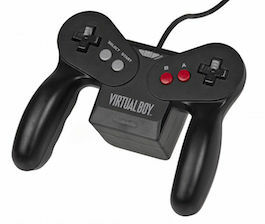 However, technical development difficulties meant that the device would forever remain in the prototype phase despite having developed 4 games for this product. This was a huge flop for Sega. 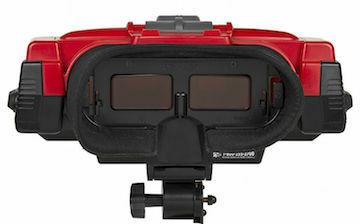 The Nintendo Virtual Boy (originally known as VR-32) was a 3D gaming console that was hyped to be the first ever portable console that could display true 3D graphics. It was first released in Japan and North America at a price of $180 but it was a commercial failure despite price drops. The reported reasons for this failure were a lack of colour in graphics (games were in red and black), there was a lack of software support and it was difficult to use the console in a comfortable position. The following year they discontinued its production and sale. In 1999 the Wachowski siblings’ film The Matrix hits theatres. The film features characters that are living in a fully simulated world, with many completely unaware that they do not live in the real world. Although some previous films had dabbled in depicting virtual reality, such as Tron in 1982 and Lawnmower Man in 1992, The Matrix has a major cultural impact and brought the topic of simulated reality into the mainstream. The first fifteen years of the 21st century has seen major, rapid advancement in the development of virtual reality. Computer technology, especially small and powerful mobile technologies, have exploded while prices are constantly driven down. The rise of smartphones with high-density displays and 3D graphics capabilities has enabled a generation of lightweight and practical virtual reality devices. The video game industry has continued to drive the development of consumer virtual reality unabated. Depth sensing cameras sensor suites, motion controllers and natural human interfaces are already a part of daily human computing tasks. Recently companies like Google have released interim virtual reality products such as the Google Cardboard, a DIY headset that uses a smartphone to drive it. Companies like Samsung have taken this concept further with products such as the Galaxy Gear, which is mass produced and contains “smart” features such as gesture control. Developer versions of final consumer products have also been available for a few years, so there has been a steady stream of software projects creating content for the immanent market entrance of modern virtual reality. It seems clear that 2016 will be a key year in the virtual reality industry. Multiple consumer devices that seem to finally answer the unfulfilled promises made by virtual reality in the 1990s will come to market at that time. These include the pioneering Oculus Rift, which was purchased by social media giant Facebook in 2014 for the staggering sum of $2BN. An incredible vote of confidence in where the industry is set to go. When the Oculus Rift releases in 2016 it will be competing with products from Valve corporation and HTC, Microsoft as well as Sony Computer Entertainment. These heavyweights are sure to be followed by many other enterprises, should the market take off as expected.